Green products will feature heavily amongst Toshiba's exhibits in Berlin this week. On view will be LCD TVs, LED technology, notebook PCs and the Super Charge ion Battery aka SCiB. The company's booth will be at Hall 21A, 101. The company published its Environmental Vision 2050 last year and aims amongst various measures to reduce its carbon dioxide emissions by 117.7 million tons a year by 2025. Cutting energy use in LCD TVs is demonstrated by the 42XV515D and a 'concept future' model. The 42XV515D uses a display brightness control that reduces the backlights, weighs 19 per cent less than its predecessor and reducing CO2 emissions by 173g a day from previous models. The future model uses a new panel that curbs power consumption by 20 per cent, which is equivalent to reducing daily CO2 emissions by 216g. Light-emitting diodes (LED) convert electrical energy into optical energy unlike regular lighting using florescent or incandescent lamps. In the Japanese market, the E-CORETM 100 and E-CORE 60 LED downlight series reduce CO2 emissions with no loss of brightness. These have a long life of 40,000 hours, and use only one sixth of the power of an equivalent incandescent lamp. E-CORE 60 is the industry's first dimming LED lamp. Earlier this year, the Toshiba Group announced it would stop making incandescent lamps by 2010 to cut CO2 emissions. 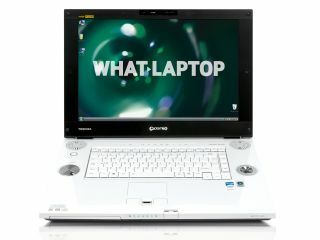 Toshiba claims its Portege R500 series of notebook PCs is the world's lightest 12.1-inch widescreen model. CO2 emissions are cut by 69g a day compared with a 2000 dynabook 2650 model. Along with a battery life of up to 7.5 hours, they are now stronger and more durable. Other energy saving technologies, such as the use of a power consumption meter that offers power saving tips, will be on display. The Super Charge ion Battery (Scib) recharges to 90 per cent of its capacity in less than five minutes. Aimed mainly at the industrial systems market, the SCiB offers a long life of over 6,000 charge-discharge cycles, even when it's regularly rapid charging.